Access data from Oracle, MySQL, PostgreSQL, MS SQL Server, MongoDB, SOAP and other REST APIs. Use built-in push, geolocation, and file services for mobile apps. Run your application on-premises or in the cloud. A library of Node.js modules. Yeoman generators for scaffolding applications. Client SDKs for iOS, Android, and web clients. Command-line tool loopback-cli to create applications, models, data sources, and so on. For more details, see https://loopback.io/. LoopBack 3.x is now in active LTS. 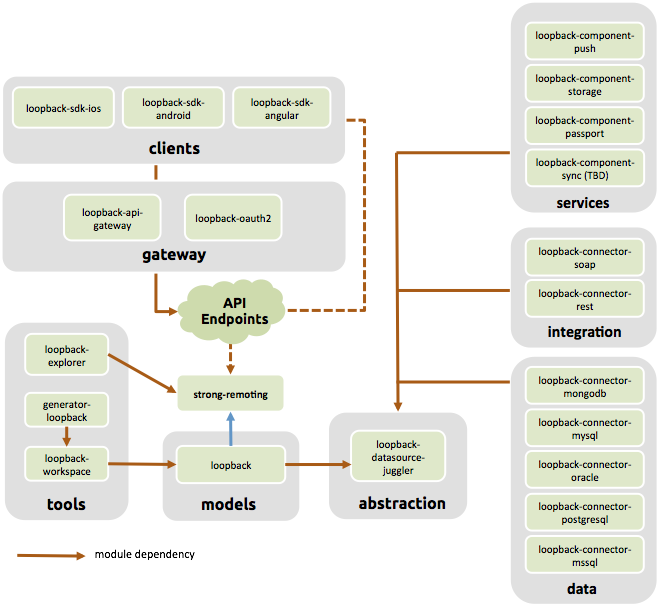 The LoopBack framework is a set of Node.js modules that you can use independently or together. The LoopBack community has created and supports a number of additional connectors. See Community connectors for details. StrongLoop provides a number of example applications that illustrate various key LoopBack features. In some cases, they have accompanying step-by-step instructions (tutorials). See examples at loopback.io for details. Contributions to the LoopBack project are welcome! See Contributing to LoopBack for more information. One of the easiest ways to contribute to LoopBack is to report an issue. See Reporting issues for more information.